Being single much of my adult life, my vacations have always been more untraditional from that of most people. I wasn’t much for the Fort Lauderdale/Lake Havasu Spring Break set in college, opting instead to work as much as possible to support what was then a complicated and expensive affinity for canned beer. In my later 20s and 30s, when I’d be inevitably forced to take my vacation time, it wasn’t uncommon for me to wind up in a Motel 6 in a remote town of 6,000 people where 45 years earlier a nationally-famous murder had occurred or an industrial disaster had killed scores. In the thick of middle age, while my friends are regularly visiting Hawaii and Epcot Center with their families, my journeys are as contrary to the quotidian as they’ve ever been. After a busy 2011 at my job, I was due to meet a group of friends at a Michigan lake house for an annual retreat of pool, fishing, and beer. We weren’t due to gather until mid-week, so I thought this was a fantastic opportunity for a pilgrimage; to wade into the heart of the American breadbasket and explore the breeding grounds that produced so many of our most-esteemed Veeps and their can-do-I-guess ethos. The wonderful thing about birth and death places for our Vice Presidents is that they’re almost never popular destination spots. I chose Omaha for my touch-down. Only slightly removed from a tarmac deplaning, to land at Eppley Field in Omaha and take a look around the terminal has an unmistakable Vice Presidential feel to it: Unassuming, bordering on meek; slightly overweight, buttermilk-white, and conspicuously more accessible than most of its contemporaries, as if suggesting that there is so little worth protecting that it would never occur to anyone to bring it harm. Speculation endures to this day if Nixon selected a pliable Ford as his successor because he could strong-arm the man from Grand Rapids into issuing a pardon if Nixon had to step aside ahead of impeachment and with a possible criminal prosecution looming. Ford and wife Betty didn’t enter 1973 imagining that the year would hold anything more eventful for them than planning their lives after his impending retirement. With Watergate spiraling out of control and the revelation that Spiro Agnew was full of more dirt than 10 Bissells, Ford would assume the Vice Presidency before year’s end. In just 20 months, the lunch bucket solon from working class Grand Rapids would be the leader of the Free World. Ford’s original birth home at 3202 Woolworth Avenue was destroyed after a fire in 1971. 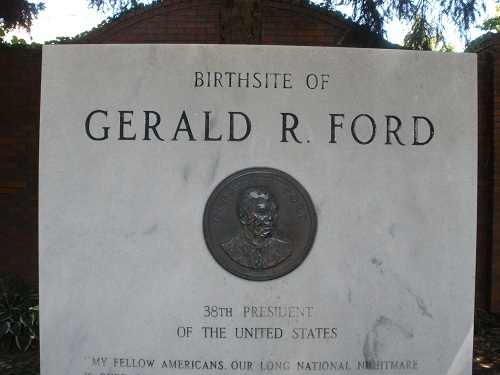 Omaha businessman James Paxson would later buy the property to create a Gerald Ford Memorial and later a rose garden in honor of Betty Ford. Ford’s Omaha connection ended within months of his birth. Born Leslie Lynch King, Jr. on July 14, 1913, Leslie Lynch King, Sr. ruled his marriage with a monarchical tyranny. Just days after his son’s birth, he threatened to kill the family and their nursemaid with a butcher knife. His mother divorced King in December of that year and fled Omaha for Grand Rapids, where she eventually married Gerald Rudolff Ford, later naming young Leslie after her new husband. Besides a July birthday, fleeing Nebraska at a young age is another thing I have in common with our 40th Vice President. I, too, was born a Cornhusker, just up the road from Jerry in the tiny farming community of Blair. Also like Vice President Ford, my youth in Nebraska is tinged with a legacy of violence. In my case, however, my parents had a loving and stable marriage. The violence I recall from my youth is one of my only memories of Nebraska—my brothers in 1969 recreating the JFK assassination at my boyhood home. Our long, serpentine front sidewalk was Dealey Plaza, my parents’ bedroom the 6th floor of the Texas Book Depository. A Daisy Spittin’ Image air rifle served as the bolt-action Mannlicher Carcano M91/38 used to dispatch the President. My brother, Jim, was Lee Harvey Oswald. The Presidential Limousine was a battered Red Rider wagon, and the role of the slain President was played by a hastily made effigy stuffed into my brother Tom’s confirmation suit. Lost to memory is whether one of my sisters or a neighbor girl was recruited to play the First Lady. That early memory said much about the Vice Presidential obsession that would come to dominate my adult life: My most vivid early recollection was that of my siblings recreating the ascension of America’s 37th Vice President to the highest office in the land. That tableau came back fresh on this sweltering August afternoon when I stood before my early childhood home for the first time in nearly 40 years. If that formative scene explained the genesis of what would become my life’s avocation, what I saw when I looked up from my reverie suggested that my path was practically pre-ordained. 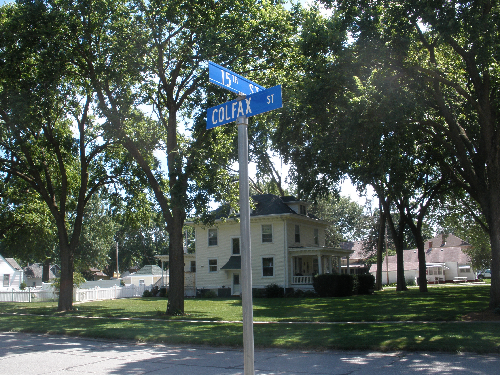 I’d long heard talk of Colfax Street after we’d left Nebraska for the greener climes of Oregon, but I never realized that the home I was born into was at a cross street named for our 17th Vice President, Schuyler Colfax. The Colfax name courses through the veins of so many of these midwestern communities that owe their prosperity to the nefarious influence of the rise of the railroads. 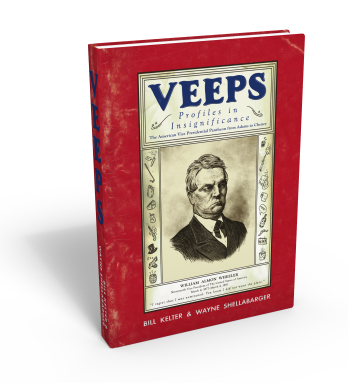 After Woodmen Of The World, the most prominent corporate presence in downtown Omaha is that of the Union Pacific Railroad, whose actions a number of politicians—including Colfax—were allegedly paid off not to investigate in what became the biggest scandal of its day, Credit Mobilier. An enthusiastic and unindicted champion of the railroads, Colfax’s graft in his ties to the Credit Mobilier scandal are often cited as the reason Ulysses Grant did not seek Colfax’s renomination as his Vice President in 1872. On sacred ground where animals once ran wild and spirit legends endure, Wind Goddess won the 9th race, paying $27.40 for the Exacta and $4.80 to show. I was headed east on Monday, for Cedar Rapids. You’ve read elsewhere in these pages that Wayne and I owe much of our early attention to the good people of Cedar Rapids, and specifically Cedar Rapids Gazette reporter Merle Stickney. 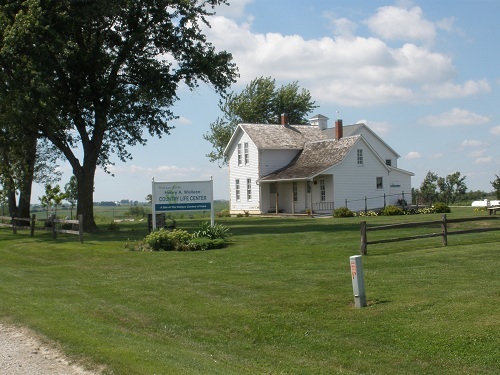 En route, I had to detour south of Interstate 80 to the quiet farming burg of Orient, Iowa, to visit the birthplace of Henry Agard Wallace, our 33rd Vice President. His memorial was understated at best, and, in this agrarian-centric region, focused more on his efforts in agricultural innovation than his tenure as Vice President, which included his embarrassing seductions by otherworldly mystic frauds and Stalin’s Russia, and the palpable terror of the American political establishment that he was in pole position to succeed a certainly soon-to-be-deceased President Roosevelt. The Wallace memorial is located at 2773 290th Street in Orient. 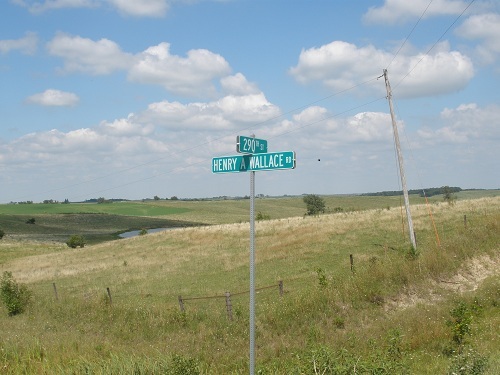 Don’t let the address fool you: This is deep in farm country, and the “Street” designation is misleading, as it is actually a dusty road in the midst of sparsely populated rolling fields, just off of Henry A. Wallace Road. Their website said that someone was on duty in the afternoons until 4:00 PM. I expected to be greeted by a pair of septuagenarian women whose knitting I interrupted. Instead, I landed in eerie quiet at a rural home. I could only think of the police who first came upon the bludgeoned Clutter family, or one of the Charlie Starkweather victims. After further exploration, I found a display that offered maps for a walking tour of the property, saying that someone would be available at a certain time during one day of the week, but if you arrived at any other time, please take the map and enjoy your exploration of the grounds. So trusting in the Grain Belt. I come from the cynicism and distrust of urban and suburban America where if you leave anything unattended for more than a moment you are simply asking for it to be stolen. I made it to Cedar Rapids at the end of the day. I checked in to the Best Western Cooper’s Mill and picked up a copy of the Cedar Rapids Gazette. Such a warm little town. To look over the grassy knoll across the Iowa River was to look at America—at the red neon of the Quaker Oats plant that makes processed food for our kitchen tables; at the charming downtown alighting beyond the Third Avenue Bridge, ringed by crumbling relics of a more prosperous era; the occasional Earth Mover hinting at a determined but certainly doomed bid to create a something of relevance in a world that only seems to acknowledge its existence whenever it needs its vote. And it’s that grit and persistence in the face of existential futility and the doom of a life of quiet desperation, increasingly desperate, that so attracts me to Cedar Rapids. Even more than Omaha, Cedar Rapids is the Vice Presidency of our American cities. I was disappointed that Merle had apparently moved on to a weekly in Ottumwa, but enjoyed my stay nonetheless. 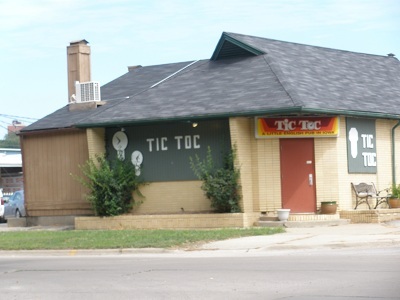 After a walk downtown and lunch at the Tic Toc, where Merle interviewed Wayne and I before the 2008 Caucuses, I headed east towards the grave of Charles Gates Dawes in Chicago, and the crossing of the Mississippi at Clinton, Iowa. DeWitt Clinton was not a Vice President but part of the Clinton clan of New York—sort of the first Kennedys of the new country. His uncle, George Clinton, not only had the audacity to pursue the Vice Presidency nearly a decade after he was by his own admission too senile to pursue continued public life, he then served not one but two different Presidents as Vice President. It’s a testament to Americans’ faith in the soundness of the executive branch they created that they wouldn’t fear that a man of dramatically failing health, years beyond reason or coherence, could pose a threat to the leadership of such a young and fragile country. 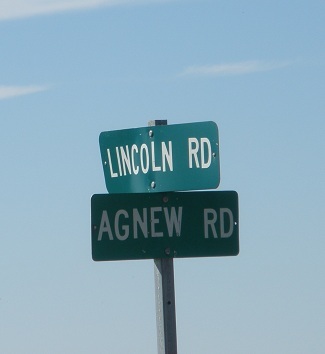 As I passed out of Iowa and the cradle of insignificance, my journey was essentially over. Iowa defines the Vice Presidency even better than Indiana and Ohio, which have produced many more Veeps. It attracts little emotion, no passion; its views, when extolled, masquerade as mainstream but often hover around the fringes. From top to bottom, their most remarkable quality is their unremarkable nature. And America only thinks of them every four years. Iowa always honors our statesmen. Coming in December: Rancho Mirage, Whittier, and Yorba Linda, and the first openly, widely, actively despised Vice President in history.